B2B social media selling – how do you score? If you try taking our sales manifesto on-line assessment (free) you will find that the area that B2B consistently seem to struggle with is social media selling. Our current database shows this to be the lowest of 15 main areas of sales competence (52% vs 85% for the highest average score). With this in mind, we offer this rapid diagnostic to help you categorise yourself as a sales team, and act on the results today. Our social media selling grid effectively uses two dimensions: Quality of on-line profile vs. quantity of views of that profile. We use Linked-in as a base as it is normally considered the premium B2B social selling platform. You could also perform a similar assessment on twitter, Instagram or other platforms. Note down the “profile strength” on the right hand side of the page (ranging from beginner to all-star). This is the ‘quality’ measure. Next, from the “profile” tab, select the “Who’s viewed your profile” tab and note down the number of “profile views in the last 90 days”. This is the ‘quantity’ measure. When you have all the profile views in for the team, workout a mid-point which in any case should be above around 30. Place your team members in the grid below. Those with less than 30 profile views end up on the bottom row. Those with Expert or All Star profiles end up in the right hand column. Congratulations if all your team are supermodels – highest quality profiles, and being seen by decent numbers – you are obviously a very social selling savvy organization! 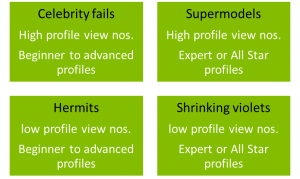 If you have celebrity fails (Those very visible individuals who probably shouldn’t be until they improve their Linked-in profiles) or other quadrants, then read on to find out how you can act on your analysis. Here are some tips per quadrant to move things forward. Supermodels: Set the bar higher! Increase the number of profile views required to make it to supermodel category – encourage your great team to do even more! Celebrity Fails: Improve your profile quality right away! Linked-in offers good advice on how to do this as do many other websites. 30-minutes work is enough to make a big difference to profile quality. Shrinking Violets: You need to get your profile views up! This is a simple case of being much more active on Linked-in: Post comments, share links, comment on special interest groups, share your own organisation’s on-line content – basically be present! Hermits: The old adage of quality before quantity stands here, in other words, improve the profile quality, then start being more visible with the same approach as the Shrinking Violets. Answer questions in special interest groups where you have expert knowledge. Introduce your connections to each other where that adds value. Put your connections forward for new positions / job opportunities. Offer genuine congratulations to connections when they move roles. Of course, then comes a time when we should be more direct and offer to meet in order to discuss a prospect’s needs. If we have a reputation as a helper rather than as a product pusher, then this request is likely to be well received. B2B sales people must realise that their main work is to position themselves as an industry specialist, NOT a salesperson. In this way, it’s possible to win work the way supermodels do, by being visibly excellent! You can access the sales manifesto here. We can arrange a ½ day social media workshop where your team can make progress on their profiles straight away.